Journey Blevins leaps to block a Graham hit during the opening set of the Central Buckeye Conference match. The game went to five sets, but NU eventually won to increase their record to 7-1 in the league. 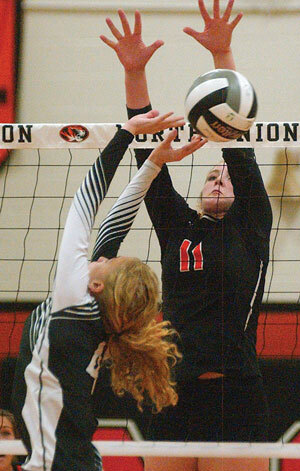 North Union’s volleyball team has made it a mission to make a big splash in its new conference. The Lady Cats are competing for the first season in the Central Buckeye Conference, after more than two decades as an affiliate of the Mid Ohio Athletic Conference. Thursday’s marathon (three hours), five-set victory over Graham upped the team’s conference mark to 7-1. As the season winds down, they’ve been able to come through with a lot of tight battles and close calls. “I think that by joining this league we have seen more consistent competition,” said coach Peg Curts. “There is not any one night that we can walk into a gym and underestimate who our opponent. That team work was evident from the first serve as the Lady Cats were able to one-two punch the Lady Falcons with a Josie Duncan set, followed by a Journey Blevins or Lissie Michael hit that helped NU take a 13-8 lead. Volleyball, though, is a game of runs and the Falcons clawed their way back to bring set one to a 17-17 stalemate. Each side kept the score tight and pushed the game to extra points as neither could gain the two point-edge needed to win. That held true until Michaels blasted a heavy shot through the Falcons’ front line to win, 31-29. “We just have some awesome hitters on our net,” said Curts. “Even when another team figures out how to shut one hitter down, we can just turn around and go some place else. Set two was more of the same as both teams jockeyed for the lead through the first 10 points. Graham started to slowly pull away for a four-point lead. That led the visitors to a 25-23 triumph. It was the same thing, just a different set during the third game. NU then found some momentum off a Michael’s blast for an 8-7 margin. Duncan followed with a tip over the net to give North Union a 9-7edge. The ensuing momentum carried the Cats to a 25-19 win and a 2-1 match advantage. Graham was able to right the ship in set four. The game was knotted at 15-all, but the Lady Falcons were able to pad their lead to 20-16. That was all it really took for them to win 25-21 and force a fifth and deciding set. With the match on the line, the Falcons provided service to open the final set. It was North Union, though, which took the first point. Brycelyn Deickert gave NU a 2-0 lead with a solid block on the front line. However, like the other four sets, neither team would give up as the Falcons kept the game tied through 6-6. The Lady Cats were able to employ its big hitters Blevins and Michael to give them the edge. That was all that was needed for NU to win set five, 15-9, and win the match. The win increased the Lady Cats’ overall record to 12-5. North Union will return to the court Monday by hosting Elgin.